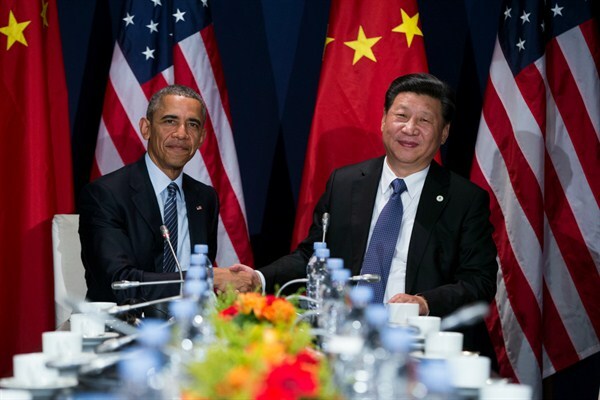 U.S. President Barack Obama and Chinese President Xi Jinping at the Paris Climate Conference, Le Bourget, France, Nov. 30, 2015 (AP photo by Evan Vucci). Given global headlines, you might think the world is terribly off course. Geopolitical rivalry threatens stability from Eastern Europe to the South China Sea. Jihadi terrorists sow mayhem throughout the Middle East. A scary virus emerges in Latin America, spreading across borders. A Brazilian president is brought down, as the Panama Papers expose corruption in other lands. Publics everywhere, alienated by yawning inequality and anemic growth, vent their frustration at a system rigged for moneyed elites. Populist politicians, sensing the sour mood, promise to reverse globalization by building walls to keep out foreigners and abandoning trade agreements.